President Kenyatta signs into law the Computer Misuse and Cybercrimes Bill, 2018 – Kenyatta University TV (KUTV). All Rights Reserved. NAIROBI, 16 May 2018 (PSCU) – President Uhuru Kenyatta has today signed into law the Computer Misuse and Cybercrimes Bill 2018 that criminalizes abuse of persons on social media, removing the legal lacuna that existed. The Act – which spells out stiff punishment to cybercriminals –provides for timely and effective detection, prohibition, prevention, response, investigation and prosecution of computer and cybercrimes. President Kenyatta also assented to the Public Trustee (Amendment) Bill, 2018. This Bill amends various provisions of the Public Trustee Act, bringing it into conformity with the Constitution. 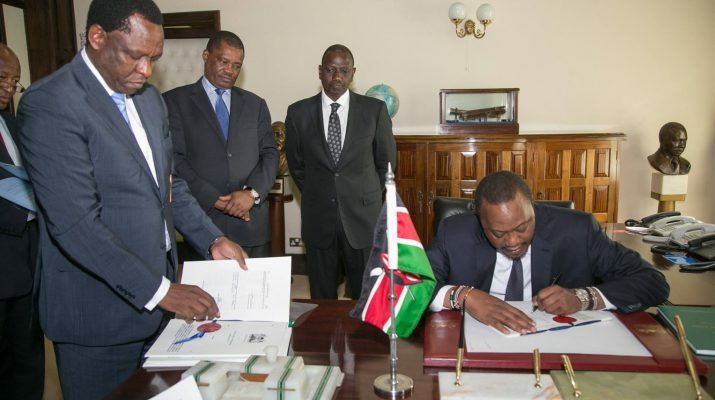 Present during the signing at State House, Nairobi, were Deputy President William Ruto, Interior Cabinet Secretary Fred Matiang’i, National Assembly Majority Leader Aden Duale, Attorney General Paul Kihara Kariuki and Solicitor General Kennedy Ogeto.